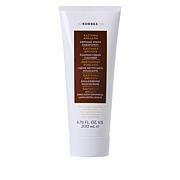 Korres Double Size Olympus Tea Foaming Cleanser - 13.53 fl. oz. A 3-in-1 gentle cleansing emulsion that effectively removes dirt, debris, impurities and make-up from face and eyes. It cleanses the skin, without leaving any oily residue. It cleanses the skin while providing instant and long-term moisture to the skin, while helping skin fight against free radical aggressors. 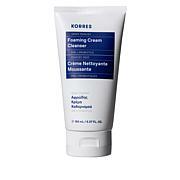 Clinically shown to improve skin moisturization after 1 hour. Clinically shown to provide short-term and long-term moisturization, with continued use. Rub gently into the face, neck and eye area; remove excess emulsion with cotton pads. Can be rinsed or tissued off. 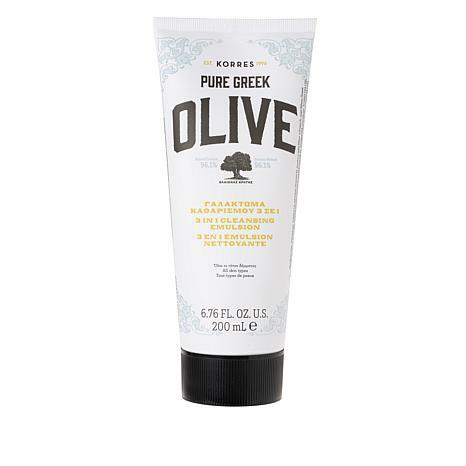 Follow up with Olive Oil Day Cream during the day or Olive Oil Night Cream at night. Ingredients: Aqua/Water/Eau, Hydrogenated Polydecene, Squalane, Propanediol, Dicaprylyl Carbonate, Aloe Barbadensis Leaf Extract, Ascorbyl Palmitate, Benzyl Alcohol, Bioflavonoids, Brassica Oleracea Italica Broccoli Extract, Caprylyl Glycol, Carbomer, Cellulose Gum, Chamomilla Recutita Matricaria Flower Extract, Ethylhexylglycerin, Glycerin, Helianthus Annuus Sunflower Seed Oil, Lactic Acid, Lecithin, Microcrystalline Cellulose, Olea Europaea Olive Fruit Oil, Olea Europea Olive Leaf Cell Extract, Olea Europaea Olive Leaf Extract, Panthenol, Parfum/Fragrance, Phenethyl Alcohol, Phenoxyethanol, Potassium Sorbate, Prunus Amygdalus Dulcis Sweet Almond Oil, Sideritis Scardica Flower/Leaf/Stem Extract, Sodium Benzoate, Sodium Hydroxide, Tocopherol, Trideceth 8. Love this product. It melts in my hand and glides smoothly over my face and seems to melt my makeup in just seconds. It doesnt dry out my face. I havent had to apply nightly moisturizer because of how great this product leaves my skin after cleansing. Olive oil is so great for our skin. I have sensitive combination skin and this cleanses and hydrates my skin beautifully. It smells great too! I loved this, it smells nice feels wonderful going on and it wipes off easily and leaves your skin fresh and moist. Its very gentle and the scent is mild and not lingering.